Many children experience problems with behavior, emotions, or learning. Health care providers rely on parents to describe how children act outside of the doctor’s office, in order to identify potential problem areas. However, it can be challenging for parents to recognize their child’s behavior patterns and understand what should be shared with the child’s health care provider. The C.S. 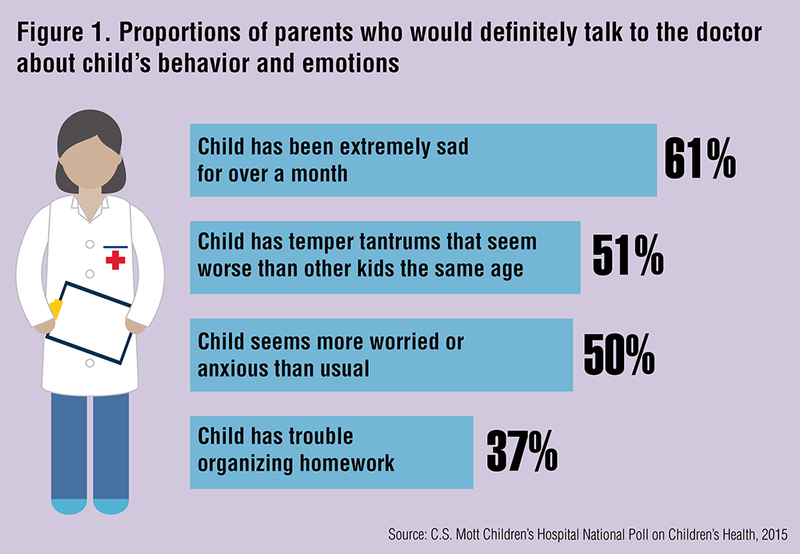 Mott Children’s Hospital National Poll on Children’s Health asked a national sample of parents of children 5-17 years old about discussing their child’s behavior or emotions with the doctor. Parents vary in their likelihood of discussing different types of behavioral concerns with their child’s doctor: 61% of parents definitely would discuss a situation where their child has been extremely sad for over a month, but only half would discuss temper tantrums that seem worse than other kids the same age, or their child being more worried or anxious than usual. Only 37% would definitely talk about trouble organizing homework (Figure 1). Why Not Talk to the Doctor? The most common reason parents would not discuss their child’s behavior or emotions with the doctor, given by 45% of parents, is the belief that these are not medical problems; 39% of parents say they would rather handle it themselves; and 29% would rather speak to someone other than the doctor. Only 6% of parents say there is no time during the doctor visit to discuss concerns, and only 8% say the doctor wouldn’t know what to do. Over 60% parents would definitely talk with the doctor if their school-age child were extremely sad for more than a month. Only half would definitely discuss temper tantrums or anxiety, and just over one third would discuss trouble organizing schoolwork. The most common reason parents would not discuss their child’s behavior and emotions is the belief that they are not medical problems. Behavioral health problems, sometimes called mental health problems, affect boys and girls of all ages, impacting their learning, social interactions, and physical health. Some are mild and short-lived; others are signs of longer-term problems such as depression, attention deficit-hyperactivity disorder, anxiety, mood and behavior disorders, and substance use. In any given year, up to 20% of US children experience a disorder that reflects a serious change in behavior, learning or handling of emotions. Most behavioral health issues among children can be managed successfully. Early recognition of symptoms and problems is essential to ensuring that children get the resources they need. Once a concern is identified, the child’s health care provider can assess the severity of the problem, offer parents guidance on strategies to deal with certain behaviors, and refer to behavioral health specialists when needed. However, early recognition requires parents to assume several key responsibilities. First, parents must recognize a behavior pattern in their child. Second, they must be aware that the behavior is a child health issue. Finally, parents must be willing to speak with the child’s doctor or other health care provider about the behavior they have observed. Findings from this National Poll indicate that many parents do not fully understand their role in helping to identify child behavioral issues. A sizable proportion of parents would not necessarily have a discussion with their child’s doctor about signs of possible depression (being extremely sad for an extended period), anxiety (being more worried or anxious than usual), mood disorders (temper tantrums), or attention-deficit disorder (difficulty with organizing homework). Without parent discussion, providers may have insufficient information to identify important signs of potential problems. The reason for parents’ reluctance to discuss is also seen in poll findings: nearly half of parents believe that behavior and emotions are not medical problems. This common misconception suggests that child health care providers may need to be very direct in explaining the link between behavioral and physical health, and asking whether parents have noticed any changes in their child’s behavior or emotions. On a more positive note, very few parents felt there was not enough time in the doctor’s visit to discuss behavior concerns, or that the doctor would not be helpful. Recognizing of the importance of this topic, many health care offices have introduced “integrated behavioral health” – where a behavioral specialist (e.g., therapist, psychologist, trained social worker) provides onsite counseling and problem-solving strategies for children and parents. A potential benefit of integrated behavioral health may involve raising parents’ awareness of the link between behavior and health and the importance of recognizing and discussing their child’s behavior and emotions. Could kids' behavior issues be a medical problem? This report presents findings from a nationally representative household survey conducted exclusively by GfK Custom Research, LLC (GfK), for C.S. Mott Children’s Hospital via a method used in many published studies. The survey was administered in November/December 2014 to a randomly selected, stratified group of adults age 18 and older from GfK’s web-enabled KnowledgePanel® that closely resembles the U.S. population. Responses from parents of children age 5-17 (n=1,277) were used for this report. The sample was subsequently weighted to reflect population figures from the Census Bureau. The survey completion rate was 54% among parent panel members contacted to participate. The margin of error is ± 2 to 3 percentage points. Clark SJ, Kauffman AD, Singer DC, Matos-Moreno A, Davis MM. Many parents missing the link between child behavior and health. C.S. Mott Children's Hospital National Poll on Children's Health, University of Michigan. Vol 23, Issue 4, May 2015. Available at: http://mottpoll.org/reports-surveys/many-parents-missing-link-between-child-behavior-and-health.